WASHINGTON -- The gridlocked Congress may be stalled in efforts to stem the flood of dark money into U.S. elections, but a new analysis suggests much of America doesn't necessarily need to wait for Washington to act in order to shed light on secret campaign cash. Undisclosed donations poured into electoral politics after the Supreme Court's 2010 decision in the Citizens United case, which allowed corporations and certain tax-exempt charities to spend unlimited amounts to influence outcomes. 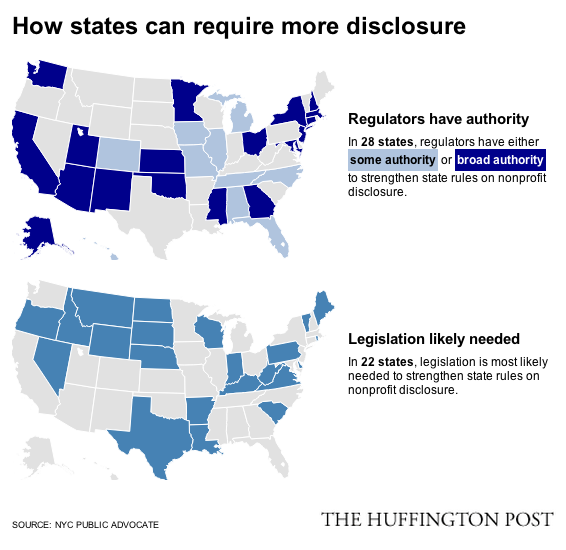 Proposals to require disclosure, much less turn off the spigot, have gone nowhere. But according to a new analysis by New York City Public Advocate Bill de Blasio that was provided to HuffPost, more than half the states already have it within their power to start compelling disclosure from groups like Karl Rove's Crossroads GPS, which spent more than $70 million during the 2012 elections. Indeed, the report, called "Building A Frontline Defense To Stop Secret Political Spending," found that 28 states already have many of the tools and laws on the books that they need to tighten rules around campaign finance. These states can require groups to unmask their donors when they seek to sway local election contests, according to the report. In many cases, the officials in charge could do so without any outside approval, including in such battleground states as Colorado, Florida, Iowa, Michigan, Missouri, New Hampshire, New Mexico, North Carolina and Ohio, the report says. And that requirement would reveal to voters the identities -- and potentially the motives -- of the outside groups and individuals seeking to determine who wins local elections. “In most states, and at the federal level, transparency of corporate spending in elections can simply be required by the appropriate regulatory agencies -- if they have the resolve to exercise their authority," said Craig Holman of the nonprofit advocacy group Public Citizen. Holman, an expert in campaign finance law and governmental ethics, pointed to recent efforts by New York Attorney General Eric Schneiderman to do just that. "This report carries that example to the rest of the nation and shows us how,” Holman said. The New York attorney general came up with the rules after a series of hearings in the state. The new regulations, which he is just starting to implement, require groups that spend more than $10,000 on New York elections to file itemized lists of expenditures above $50 and donors who give more than $1,000. De Blasio, who has taken a special interest in campaign finance since the Supreme Court's infamous ruling, has already had some success in persuading New York-based corporations to swear off unlimited campaign spending. His office decided to take a look around the nation to see where else the steps that Schneiderman is taking could be put into practice. “This a road map for every state in the union," de Blasio said in a statement, although the report notes that nearly two dozen of the states may have to pass new laws first. Still, if only a few of the swing states identified in the report require disclosure, it could illuminate the sources behind the dramatic surge in secret spending, which amounted to more than $300 million in 2012. The vast majority of that money -- 85 percent -- was spent by conservative groups, according to data crunched by the Center for Responsive Politics.